How Much is Sleep Dentistry? How much Sleep Sedation Dentistry Cost? Generally the cost of IV sedation dentistry is $500 – $1000 per hour depending. The cost of IV dental sedation depends of the patient history, the types of dental procedures being performed, the length of the procedures, the number of IV sedation visits and the amount of the IV sedation periods of the sedation visits. In many cases where the dental procedures are long and complex, Maryland Sedation Dentist may offer IV sedation dentistry free of cost. So what is the cost of sedation dentistry? Dr Gary Adams, our sedation dentist says sedation for nervous patients makes his job easier and is more comfortable for the patient. The patients also heal faster when they sleep comfortable through their dental appointments. For those who need less profound sedation, dental gas or nitrous oxide sedation may be more practical. Cost of IV sedation dentistry is usually much less than the time associated with multiple appointments and the trauma of sitting through the procedures alert. 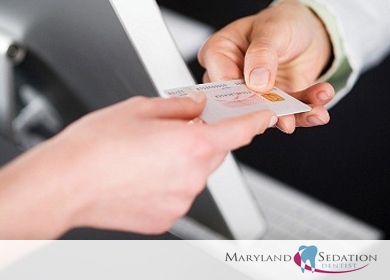 Additionally, Maryland Sedation Dentist will usually adjust the cost of the case with the ease of the sedation experience in mind. Sedation makes for an easier experience for the sleep dentist and the sedation patient.